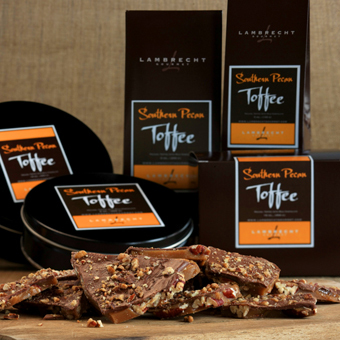 A truly extraordinary toffee, handmade from a Southern family recipe. Plump roasted pecan halves are covered in rich butter toffee before being drenched in creamy Belgian milk chocolate. 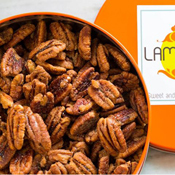 With a perfect amount of crunch in each and every bite, our award-winning Southern Pecan Toffee from Lambrecht Gourmet is a gift you will be proud to give.....and delighted to receive! Sugar, Butter, (sweet cream, natural flavoring. Contains: milk) Pecans, Milk Chocolate, Sugar, Cocoa Butter, Dry Whole and Skim Milk, Soya Lecithin and Pure Vanilla). David Smith had a love of candy from an early age. His father, however, a dentist, wouldn't allow it in the house. So every now and again, when the urge became to strong to resist, David would sneak a Heath bar. He loved them so much that he developed his own recipe. The rest, as they say, is history. 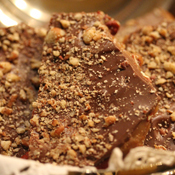 David spent years in the catering business, and made his now famous pecan toffee as gifts for family and friends in Arkansas. When offered a position as the manger of the idyllic Red Apple Inn and Resort in Heber Springs, he jumped at the opportunity. Patrons of the inn loved his toffee and, at the urging of the owners, he and Nancy began selling the decadent treat in a local gift shop. It was an instant success, and it wasn't long before the couple found themselves taking the toffee to showrooms in Dallas and Atlanta. He knew he had found his calling after attending a chocolate-making course in Montreal at the Barry Callebaut Chocolate company, where he fell in love with the science and complexity of chocolate making. David & Nancy founded Lambrecht Gourmet with one single goal in mind. 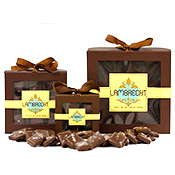 They wanted to create the best toffee, using single origin chocolate from Venezuela and premium butter. The domestic pecans, pistachios and other nuts are all sourced domestically from top growers. The toffee contains no preservatives. Lambrecht's was named America's Top Toffee in 2012 at the Salon International Chocolate competition in California. In 2013, the company was selected as one of America's Top Chocolatiers at the same competition for their Fleur de Sel Toffee. This item is sensitive to heat. To protect your order in warm weather—typically April 15 through October 15 - or when shipping to a hot destination, 2-day air shipping is required. When estimating days in transit, please exclude shipping date and weekend days. Heat sensitive orders placed after 12:00 pm CST on Wednesday will be held for shipment until the following Monday.